I'm a member of the OCA. We don't have a Western Rite. In point of fact, we've been kinda opposed to it. But I love it. 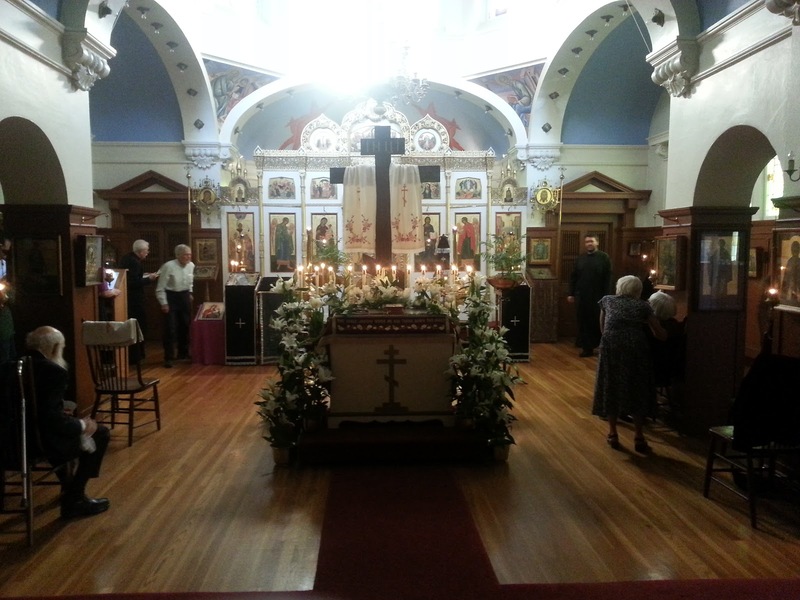 I'm so pleased with it that were a parish to form in San Francisco, I'd be hella supportive. The why of that is complex. I was Chrismated into the ER, I love Russian style chanting and I think our ER Holy Week is head-over-heels awesome. I can chant our services well, I enjoy serving and I can - with the help of our expert choir director and his "idiot books" as they are called - navigate our complex services. I miss, however, the simplicity of Low Mass, the starkness of Stations of the Cross, the richness of the daily office. In the light of that last item, I am also a Novice Oblate of the Order of St Benedict, and I use a WR Daily Office as posted on a domain ironically called "Eastern Rite". I admit I'd like a WR parish with no pews... but the organ doesn't scare me if it's done right. A "concert mass" isn't a bad thing if it furthers devotion. The Rosary doesn't need "Creative visualization" in order to "work". As St John of San Francisco pointed out, the West was orthodox a long time before it wasn't - and, unlike the East, the West never fell into heresy: which is why Maximus the Confessor took refuge with the Pope when the entire eastern Church fell away from the Faith. The Western Liturgy is missing some of the "Correctives" added to the ER, because we never needed them in the West. Additionally, the "didactic hymnody" of the East is missing in the West because preaching the full faith was never outlawed here (at least not yet). I'm not one of these people who imagines that the Western Rite is "better suited" to evangelizing Westerners. Most of the people I know couldn't tell High Mass from Divine Liturgy or Deviled Eggs. The unchurched, however, need missionaries and need priests. There are enough ER communities in SF - some ROCOR Parishes are only blocks from each other. What there are not: more than only and exactly one traditionalist WR anything. What could hurt? 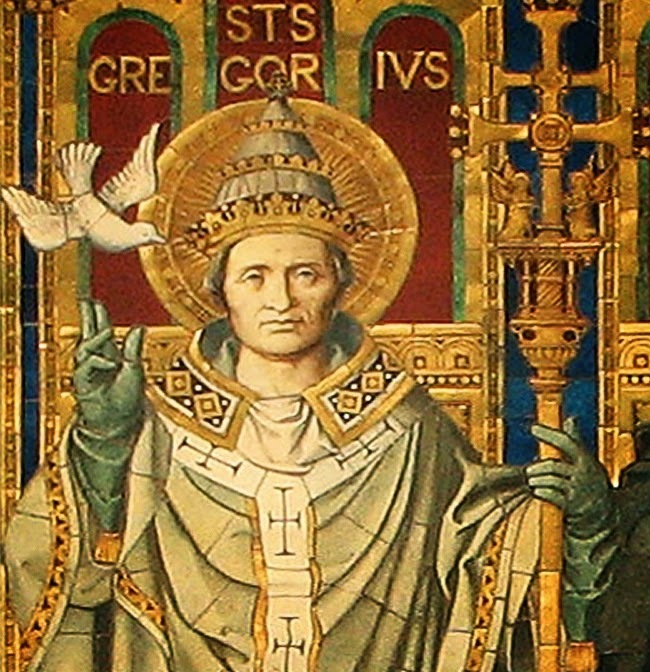 Let us pray to Pope St Gregory the great that someone will send us a new Augustine or a new Patrick. Let us pray that someone will send a new Cyril and Methodius. Let us beg for a new St Innocent. Let someone learn the language and reach out to us. So if anyone is in SF and wants to pray the daily office, get with me: I do it almost daily. And if any missionaries out there want to evangelize in SF, you should let me know. I'd love to help. In the Eastern tradition, regular hourly prayers are suspended through bright week (from Pascha until the following Saturday). During that time the following Paschal Hours are read for all the “minor” hours – The midnight office, Prime, Terce, Sext and None and Compline – during the day (Matins, Vespers are also in special format). Another interesting tradition is that no psalms are read: because they are viewed as all prophecy that is now fulfilled. If you wish, I think these prayers would make a wonderful addition for Easter Week, as well as throughout the 50 days. 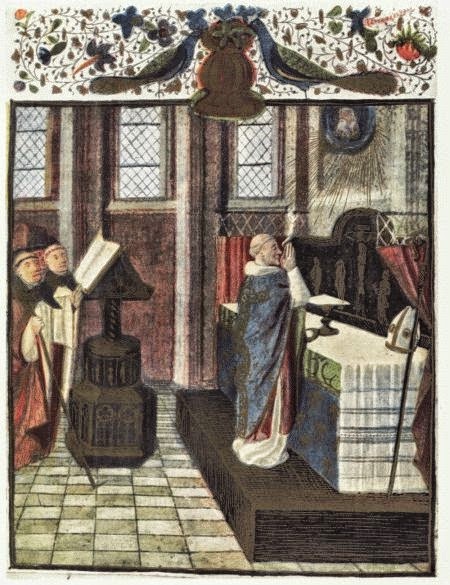 Most of the prayers are repeated – traditionally when prayers are repeated thrice (Such as the prayer “Holy God, Holy Mighty”) the sign of the cross is made at the beginning of each prayer. I’ve also marked the sign of the cross (+) at places where it is traditionally made in the Eastern Rite. Note the tones – if you are familiar with Orthodox Chant, these can be chanted, if not, just read ‘em! +Through the prayers of our holy fathers and mothers, Lord Jesus Christ, our God, have mercy on us. Amen. Before the dawn, the women came with Mary, and found the stone rolled away from the tomb, and heard from the angel: why do you seek He who lives in everlasting light here among the dead, as though He were a mortal? Behold the grave-clothes. Go quickly and proclaim to the world that the Lord is risen and has slain death. For He is the Son of God Who saves all. Though you descended into the grave, O Immortal One, you destroyed the power of Hell. And you rose as victor, O Christ God, calling to the myrrh-bearing women: Rejoice! And giving peace unto your apostles: you grant resurrection to the fallen. You were in the grave bodily, but in Hell with your soul as God: in Paradise with the thief, and on the throne with the Father and the Spirit. You fill all things, O Christ the Inexpressible. +Glory to the Father and to the Son and to the Holy Spirit. Your tomb is shown to be life-giving and more beautiful than Paradise, and truly more resplendent than any royal palace, O Christ, the source of our resurrection! O sanctified and divine tabernacle of the Most High, rejoice! For through you, O Theotokos, joy is given to those who cry: Blessed are you among women, O all-pure Lady. +Glory to the Father and to the Son and to the Holy Spirit, both now and ever, and unto the ages of ages. Amen. +More honourable than the Cherubim, more glorious than the Seraphim, who without corruption gave birth to God the Word, True Theotokos, we magnify you. O Lord Jesus Christ our God, for the sake of the prayers of your most pure Mother, of our holy and God-bearing fathers and mothers, and all the saints, have mercy on us. Amen. Glory to the Father and to the Son and to the Holy Spirit, both now and ever, and unto the ages of ages. Amen. +May Christ our true God, Who rose from the dead, trampling down death by death bestowing life on those in the tombs, through the intercessions of His most Pure Mother, and of all the saints have mercy on us and save us, for He is good and the Lover of All. Paschal Tropar set to Dixie? Just look, the gates of hell: they're falling! Crumbling from the inside out! He's bursting through the walls with laughter - Ha! Listen to the demons shout! Themselves displease, and ’gainst Him rise. On this day we commemorate the Institution of the Eucharist, the beginning of the on-going mystery of Christ in His Body, the Church. It all ties together now: the Body of Christ, present, feeding us who are Christ, active, serving Christ who is you, in the world. So, I'm moving in May. For the first time since 2002. I need to ask for some help. Nothing is on the list that isn't needed - except the light saber. 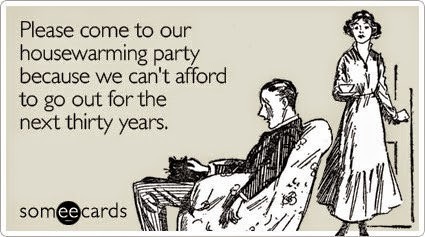 But anyway... please click on my Amazon Housewarming Registry! as it is written of him’. and to my God and your God. in the kingdom of heaven’. That's when it dawns on me that Holy Week is not primarily about a commemoration of the Passion and Death of the Messiah. Besides we have that event every time we break bread together in his name. 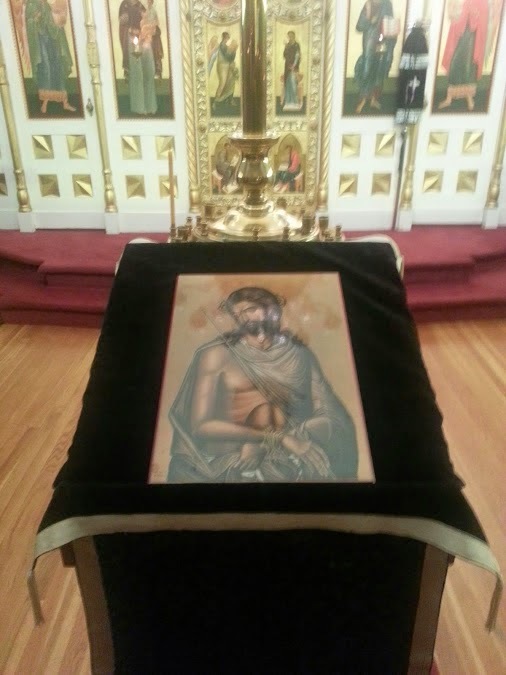 Holy week is, at heart, an initiatory rite. It is about making us ready to die, in our selves, in order to be ready to participate in his Resurrection. Naturally this is so: it is the time for baptisms. But it is not only the newly illuminated that participate in Holy Week, it is all of us. And like Confession is a little refresher in on the Baptism, Holy Week is a reminder of the death of self-will, the sacrifice of ego, the end of self-love that is required to really love God and our Neighbor. Only when the ego dies can we realize the Neighbor is us. And God. Wednesday in Holy Week - MP - EP - Martyrology. Maundy Thursday (Anicetus, PM) - MP - EP - Martyrology. Good Friday - MP - EP - Martyrology. Holy Saturday - MP - EP - Martyrology. Sunday of the Resurrection - MP - EP - Martyrology. Monday in Easter 8va - MP - EP - Martyrology. 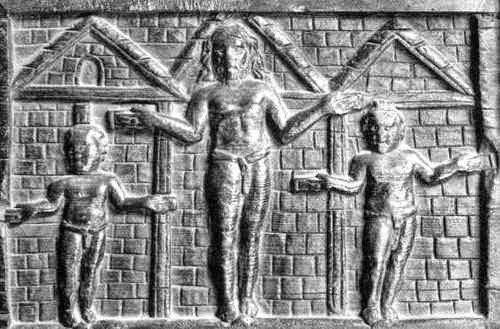 Tuesday in Easter 8va - (Ss Soter and Caius Mm) - MP - EP - Martyrology. Wednesday in Easter 8va - (George, M) - MP - EP - Martyrology. Thursday in Easter 8va - MP - EP - Martyrology. Friday within Easter 8va - MP - EP - Martyrology. Saturday in Easter 8va - (Ss Cletus and Marcellinus Mm) - MP - EP - Martyrology. Octave of Easter Low Sunday - MP - EP - Martyrology. St Mark the Evangelist (xfer) - MP - EP - Martyrology. Feria - MP - EP - Martyrology. Please join me at Holy Trinity Cathedral for some or all of Holy Week!